Give yourself a stylish transformation with this pair of rectangle eyeglasses for Men's, from the house of Salvatorio. Featuring a full rim construction, this pair comes in orange color, and is compatible both for bifocal as well as single vision lenses. The nose pads have been installed to give a better hold to the spectacles on your face. 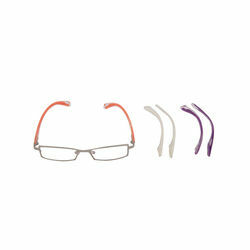 These eyeglasses come in a beautiful and sturdy case for protection against damages.